Love alone isn’t enough to overcome some obstacles. Lena Kauffman is a young Old Order Amish schoolteacher who has dealt all her life with attention raised by a noticeable birthmark on her cheek. Having learned to move past the stares and whispers, Lena channels her zest for living into her love of teaching. But tensions mount as she is challenged to work with a rebellious young man and deal with several crises at the schoolhouse that threaten her other students. Her lack of submission and use of ideas that don’t line up with the Old Ways strengthen the school board’s case as they begin to believe that Lena is behind all the trouble. One member of the school board, Grey Graber, feels trapped by his own stifling circumstances. His wife, Elsie, has shut him out of her life, and he doesn’t know how long he can continue to live as if nothing is wrong. As the two finally come to a place of working toward a better marriage, tragedy befalls their family. Lena and Grey have been life-long friends, but their relationship begins to crumble amidst unsettling deceptions, propelling each of them to finally face their own secrets. Can they both find a way past their losses and discover the strength to build a new bridge? I was pleasantly surprised to find another installment of an Amish set story by the author. I'd really enjoyed every book of hers I'd listened to. Her other books seemed to start off with a bang and build from there. This was started a bit slower but finished with a big bang. But the essence of her stories stays true. She has good insight into human nature and communicates it well. She weaves a nice story into an Amish setting and educates us on the Amish lifestyle as well. We learn that the Amish have hopes and dreams just like the rest of us. They are real people, aren't they? I'll look forward to her next book. I assume it'll be the third in the Ada's House series. I have become a real fan of ms woodsmall's books! This book is no different. There are many twists and turns that kept me rivited to the very end. Although the gal trusted God things just seemed to get worse and worse. Book shows God takes the rotten things of life and can bring good out of them if we keep trusting Him. Obviously I highly recommend this book to one and all!! What did you like best about The Bridge of Peace? What did you like least? Love these stories and like Woodsmall as an author, but in this one, the part about the cat was completely unnecessary. Would you be willing to try another book from Cindy Woodsmall? Why or why not? Yes, I will try others, I like her stories. Would you listen to The Bridge of Peace again? Why? Yes. I enjoyed this book and the look into Amish life. It continues the storyline of Cara and Eframe, Deborah and Mahlon, and introduced us to minor characters from The Hope of Refuge - Lena and her father Israel in particular. What was one of the most memorable moments of The Bridge of Peace? The scene during the basket sale was humiliating and heartbreaking and poignant. What does Cassandra Campbell bring to the story that you wouldn’t experience if you just read the book? She did a wonderful job with this story. I have not always been a fan of her narration, but she did great with her dialogues, emotions, and even the Pennsylvania Dutch. I am glad that this book was a stronger entry in this trilogy than the Hope of Refuge. I could really relate to Lena, even down to her opinions about coffee! One Amazon reviewer states that they hated the Deborah/Mahlon angle. I actually didn't. It showed some growth in Deborah - a young woman whose entire adolescence was wrapped up in this man. The pull of those dreams can be very strong. The end of the book was slightly unnecessary - I never could understand the motivations of one character - but Woodsmall does such a wonderful job of portraying the gray areas of the human condition, this is a minor quibble. I can't wait to read the Harvest of Grace, the third book in this trilogy. If you could sum up The Bridge of Peace in three words, what would they be? I love all of it...there are so many intertwined stories, I can't choose just one. Cassandra does a great job of reading...or really "acting" the stories. 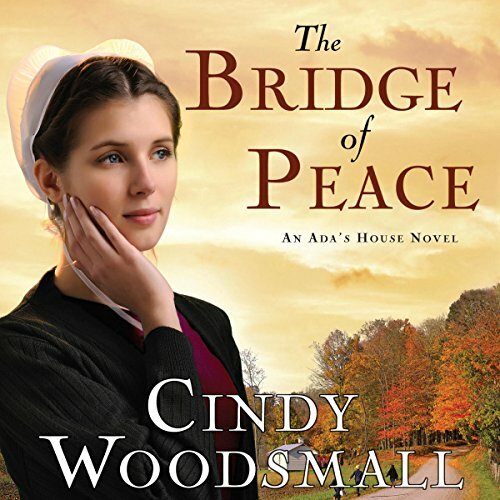 I've listened to a few of Cindy Woodsmall's novels and have loved most of them. I really enjoy Cindy Woodsmall because her faith-based stories capture how various personalities are structured and why people do the things that they do. She is very talented and her stories flow beautifully. They remind that certain human elements do reside in all societies. A couple of spots in this book did lean just a smidgeon toward the graphic, and I wasn't sure that I would make it to the end because I am not entertained by violence. But I got to the end, and I can't wait for the next Aida's House book. Cassandra Campbell did an excellent job reading this story.